In the summer 2011, Pamela Longobardi (US) swam to a massive sea cave from Liakas with Maria Rigatou (GR). It was immense and filled with many pieces of plastic, some very large. The two women swam out several large bags of material and large plastic objects. 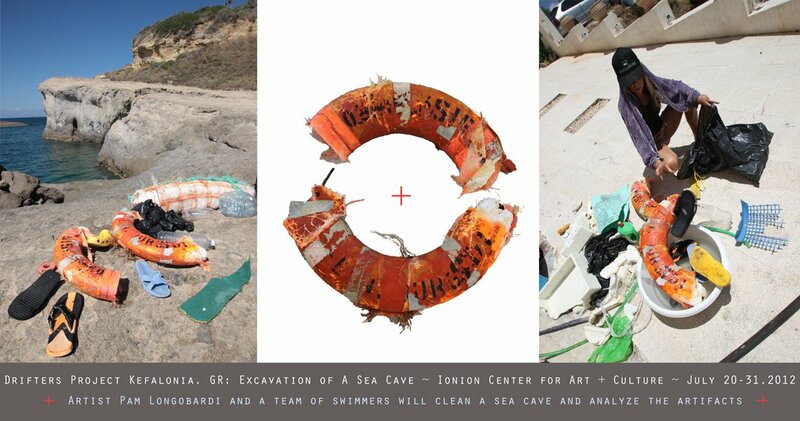 For Drifters Project/Kefalonia Phase II, Longobardi plans to clean the entire cave with a team of swimmers and to remove all the material and transport it to the Ionion Art Center to document, analyze and create a single large-scale art installation in the gallery. In July 2012 the materials will be floated out of the cave as a giant raft of plastic, a floating island chain transported by swimmers – Pamela Longobardi herself and Claudia Lamas Cornejo (GE/PE), a Berlin-based culture manager and curator of the environmental exhibition project PACKET-SOUP. This action will be documented by underwater and above water video to create a film that will be projected in the gallery with the array of plastic that is removed and sorted. A forensic study will be done of the modern-day archeology of the cave, with statistical analysis, object identification of all components, and presentation of the findings. 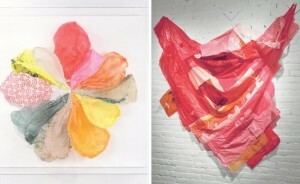 The artist and Plastic Pollution Coalition founder Dianna Cohen (US) will in addition display her abstract paintings made of plastic bags in half of the gallery space. Pam Longobardi’s work encompasses multiple mediums from painting, to photography and installation to address the psychological relationship between humans and the natural world. Her artwork was and is shown at numerous solo and group exhibitions all over the world (e.g. Venice Biennale 2009). In 2006, upon discovering the vast hoards of plastic the ocean regurgitates on remote beaches, she founded the Drifters Project, creating environmental interventions and exhibitions in Hawaii, Alaska, Costa Rica, China, Italy and Greece. Her work has been shown recently at Nouveau Musee National de Monaco, Gallery Diet in Miami, and Savvy Contemporary in Berlin. Since the foundation of SAVVY Contemporary, Claudia Lamas Cornejo is responsible for Management and Public Relations as well as for fundraising exhibition and performance projects at this non-profit space in Berlin-Neukolln. She participated as a media- and press-manager in numerous national and international exhibitions and publications. 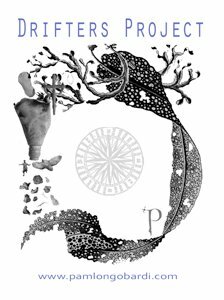 In 2012 she curated the exhibition PACKET-SOUP, an environmental exhibition project about plastic pollution. She has completed a B.A. in Intercultural Communication and a Master of Culture and Media Management at the Freie Universitat Berlin. Dianna Cohen is a Los Angeles-based multimedia visual artist, painter and curator. She is best known for her works using recycled plastic bags ranging from small hanging pieces to room-sized installations. In 2007, Cohen expanded into making wearable art pieces using recycled materials. Solo shows include Post, Art Affairs gallery in Amsterdam, the Sutton Gallery in Melbourne, and Frank Pictures in Santa Monica, CA. She has shown in group exhibitions at Affirmation Arts in NYC, the Riverside Art Museum in Riverside, the Bronx Museum in NYC and the Tampa Museum of Art in Florida and many other places around the world. Ionion Center for the Arts and Culture is the only Arts and related Sciences Institute on the Greek island of Kefalonia. It forms a broad and effective program of innovative activities in Arts and Sciences and announces and supports projects in Arts and Sciences in all disciplines. Exhibitions, presentations, art events and festivals, educational programs and research are into the activities program.